The arrest of former Bayan Muna Representative Satur Ocampo and ACT Party-list Representative France Castro after apprehended for alleged kidnapping and human trafficking of 14 minors from Talaingod, Davao Del Norte has brought back past issues that are not typically heard before. 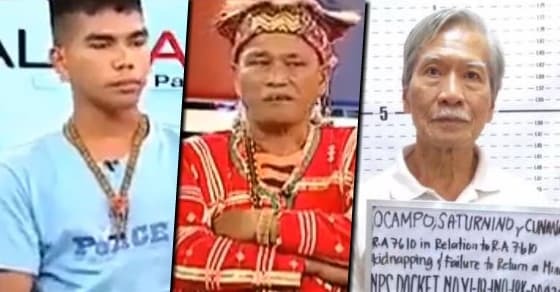 An old video of a Lumad youth leader, Asenad Bago revealed and confirmed the telltale stories of alleged recruitment of NPA and Bayan Muna to Lumad minors. He asserted that the Bayan Muna put them into rallies against the military and the government. They were taught how to use firearms and detachment at a young age. During weekends, they were brought to a place so-called “posting” or houses of NPA members. They made the kids watch videos against the government to instill anger. Bago claims that ‘Bayan Muna’ is a distraction to their studies. As if on-call workers, Bayan Muna commands them to go to Davao to rally and send out the military. In the Talk Back segment with Tina Palma of ANC, Asenad presented the NPA version of Lupang Hinirang which is on a different note. A video posted by a Facebook page, Quiet No More PH shows the facial confrontation of Lumad leaders and the group of Satur Ocampo for keeping the Lumad minors without parental consent. There, the elders rant out their sentiments against the Bayan Muna former representative being the culprit of exploiting the younger ones. The Lumad tribe deserves justice in all the desolation they experience from the NPA and the people behind the plans of detracting the current administration. The tribe just wanted to live simply in their hub but being pulled out of their comfort zones to use as front liners on the war zone. The rebels and the likes of Ocampo and Castro should be held responsible for this to stop the stigma of slavery and harassment on the whole Lumad tribe.